Thomas Agnew (1794-1871) was born in Liverpool but moved with his family to Manchester in the following year. He was apprenticed to Vittore Zanetti, an immigrant Italian craftsman carver and gilder. Zanetti built up a prosperous business at 87 Market Street Lane in making mirror and picture frames, and manufacturing scientific instruments. By 1813 he had moved to larger premises at 94 Market Street Lane, having taken on Thomas Agnew as apprentice (1). Thomas Agnew became a partner in 1816, and the firm of Zanetti & Agnew became high quality print publishers and established an exhibition gallery. In 1823 Thomas Agnew married Jane Lockett, daughter of a wealthy Salford businessman. They had two sons, William (born in 1825) and Thomas (born in 1827). Vittore's son Joseph Zanetti had joined the business in 1825, and in the following year Zanetti & Agnew moved to a prime location at 14 Exchange Street. There the young Charles Allen Du Val, newly arrived in Manchester, was introduced to Thomas Agnew. The firm published many prints engraved from his paintings, greatly helping to establish his growing reputation. (2). In 1828 Zanetti retired to his island estate in Lake Maggiore, and the business became Agnew & Zanetti. The junior partner Joseph Zanetti left in 1835, to set up his own firm in the same line of business. Meanwhile Thomas Agnew began to move the business away from craftsmen and print publishers into the business of dealing in pictures, primarily signed paintings by English artists. 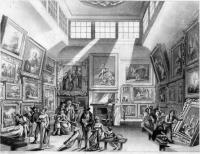 By then wealthy Manchester merchants and millowners began to collect works of art by contemporary painters. Thomas Agnew had judged the market correctly, and the business prospered. His two sons joined him, and in 1850 both were taken into partnership. The firm became Thomas Agnew & Sons, and opened a branch in London. They continued to prosper, especially after being commissioned to collect works of art from all over the country for the 1857 Art Treasures Exhibition, and carrying out the task with great success. The firm opened a branch in London, where they eventually concentrated their business as art dealers of international importance, and in 1923 the Manchester premises were closed. (2) The account of the assistance given by Thomas Agnew is taken from the obituary of Charles Allen Du Val published in The Manchester Times on Saturday 22 June 1872.